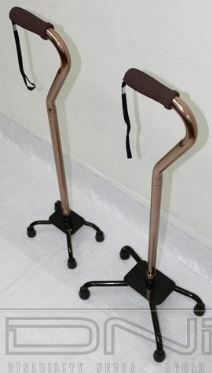 Take a step with the “bad” leg and bring the cane forward at the same time. Move the cane and affected leg forward together. The cane should be moved the distance of one average step forward with each move. You should not feel that you are stretching to catch up to the cane or stepping ahead of it. 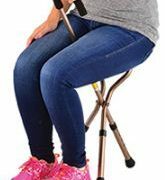 If you are using the cane for general mobility rather than an injury, hold the cane using your dominant hand and bear weight on this side of your body. 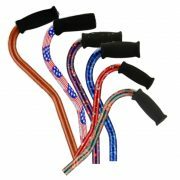 If you are working with a physical therapist due to an injury, he or she may have a specific cane-walking plan different from this one. To properly ascend stairs, it is “up with the good.” While holding onto the rail with one hand, advance the stronger leg first placing it on the step above where you are standing. After this good leg is appropriately placed on the step, advance the weaker leg up to the same step that the stronger leg is on. If there is no rail to hold on to, the cane is placed on the upper step at the same time or after placement of the weaker leg. To properly descend stairs, it is “down with the bad.” While holding onto the rail with one hand, advance the weaker leg first placing it on the step below where you are standing. After this affected leg is appropriately placed on the step, advance the stronger leg down to the same step that the weaker leg is on. If there is no rail to hold on to, the cane is placed on the lower step at the same time or after placement of the stronger leg. 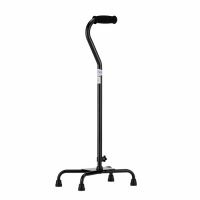 A quad cane is a mobility device that aids walking and mobility. 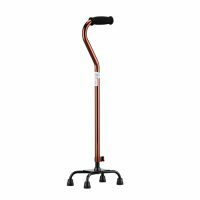 It is similar to a standard cane, but it has a metal base on the bottom with four small feet that extend off the base. 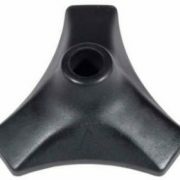 These feet have rubber caps that help reduce slippage on the floor.